This dish can be made ahead of time, and warmed to serve. Or blended into soup. Store extra parsley oil in an airtight container in the refrigerator for up to 5 days. Using a sharp knife cut the squash in half and scoop out the seeds. Then cut each half into four wedges. Trim the shallots and remove the outer peel. Arrange the squash and shallots in the tray and drizzle on two tablespoons olive oil, and a pinch of salt. Roast for 30 minutes, rotating the squash and shallots halfway through. 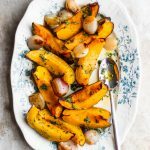 The squash and shallots are done when they are golden brown, soft and tender. Meanwhile while the squash and shallots are roasting, whisk together in a small bowl the remaining olive oil, apple cider vinegar, and a pinch of both salt and pepper. Spoon the parsley oil over the squash and shallots and toss lightly to coat. To make this dish extra festive, and delicious, add pomegranate on top as a garnish.